The tank is 100 years old on the battlefield this week. The Great War YouTube Channel has some great videos. How the tank came to be is an interesting story of a bunch of might have beens and experimentation driven by desperate need. In order to start we need to go about ten years to very early tracked vehicles. The tank museum did me the great favor of doing one of their “Tank Chats” videos on the Hornsby tractor, which was a towing tractor for artillery. Canada to haul coal. Much of this Hornsby Chain Track Tractor has survived. Several appear to have been sold to the British military, but interest in the machines faded. Hornsby sold the patents to the Holt Manufacturing Company of America in 1911. Holt later merged with C.L. Best and became The Caterpillar Tractor Company. Photo below of a steam-powered machine courtesy of Hornsby Steam Crawler. More stuff on the Hornsby. As the article says, Hornsby was not able to sell any tractors to the army and very few to the commercial market and he sold the patents for the track system to another company that has done rather well with them. 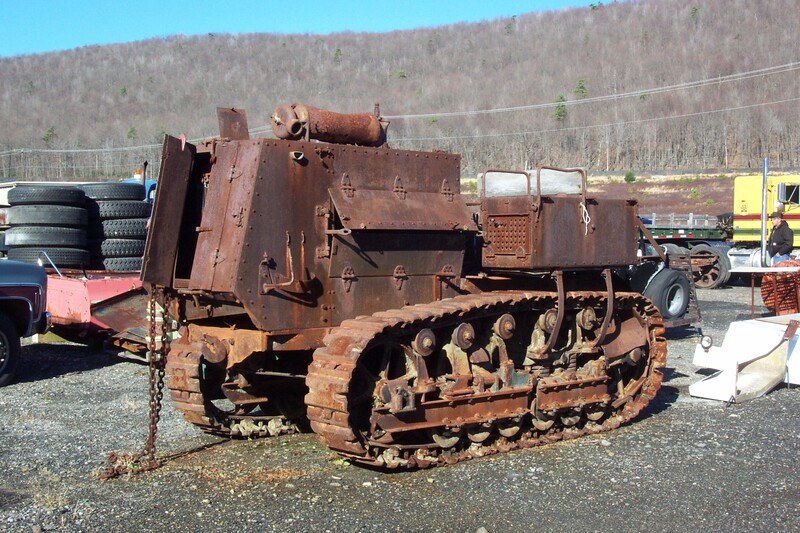 Hornsby’s were not the only tracked vehicles around, as the following videos show including the machines from Holt or as the company later became known, Caterpillar. The tank had it’s genesis in the understanding by people in the British and French militaries on just how much the machine gun coupled with modern long range and indirect fire artillery change the balance between offense and defense. The fire power of the machine gun added to the fact that they were small and easy to fortify made then defense almost impenetrable without expending a great cost in men and material. The idea of and armored carriage that protected the men inside from enemy fire had been around for centuries. The problem had always been making the thing mobile enough to be useful to any degree while providing firepower and protection. Up until the early 20th Century the means to accomplish this simply did not exist. World War 1 started with great enthusiasm by almost all the combatants. While the assassination of Archduke Franz Joseph was the proximate cause of the war, most of it seemed to be the idea that petty grievances and power politics would get their day to be redressed with guns. I don’t think that any of the combatants even thought that the clusterf**k that ensued was even possible. After the great offensive stalled into the morass of trench warfare on the Western Front developed quickly into the trenched front that would remain in spite of millions of casualties expended essentially unchanged for the next four years. When Britain entered the war, Ernest Swinton was assigned as the Official war correspondant as newspaper reporters were banned from the front by the French government who had concerns about leaking information to the Germans. Swinton had done some writing during the recent Boer campaigns in South Africa and was well regarded as a writer so the engineering officer was a natural choice. Lt Col. Swinton had what was probably a unique position because as the official “eyewitness” he was able to go and see everything. What he saw was the appalling realities of advance under machine fire across no man’s land. Swinton took his idea to Maurice Hankey in the War Office who at least initially was able to get the War Ministry to look closely at the idea. Hankey’s efforts did attract the attention of the First lord of the Admiralty, Winston Churchill. The Navy had been forced to deploy more resource on the land and used armored cars to protect it’s widespread bases and in Belgium in defense of the naval air service. By the time Swinton’s memo crossed his desk Churchill had also been thinking along the same lines and formed what was called the Landships committee to explore armored vehicle ideas and conduct some tests on tracks and platforms. The Navy was also used to technical solutions to it’s problems such as fire control and engines, so it’s perhaps no surprise that Churchill formed the Landships Committee to quietly explore better ways to build armored vehicles. The problem was that commercial tracked vehicles were not really up to the task. A Caterpillar tractor was a fairly slow machine and the tracks were more fragile than people would guess from looking at a large tractor or bulldozer. Under the stresses of the battlefield, all too frequently a Holt tracked vehicle would slip it’s track. Still the Holt/caterpillar gave an idea of the right direction. Swinton continued to press his ideas in memoranda and on mid 1915 the machine gun destroyer idea reached the desk of Sir John French who passed it on to the war office with the recommendation that efforts to pursue the idea with the correct manufacturers be secretly conducted. Little Willie demonstrated some deficiencies. First of all the track needed better climbing ability. Second the vehicle was too tall to be moved easily on British or French railroads especially with the expected turret for the armament. So the design was changed so that the tracks were carried over the vehicle body and the armament was carried in sponsons on the sides of the tank. This was Big Willie or Mother, later known as the Mark 1, the first tank to go into battle. Tank production was started with orders for 150 tanks and Swinton who had been recalled to assist with the early development was assigned to develop training and doctrine for these new fighting vehicles. Through the first part of 1916 the training and testing continued as the six companies using the vehicles became familiar with what they could do. The fledgling tank force needed time to develop. Unfortunately time was the one thing the tank corps would not get. The massive campaign at the Somme had stalled. Sir Douglas Haig had expended hundreds of thousands of men and had little or nothing to show for it. It had become obvious that something new was going to be needed. The decision was made to bring the tank to battle. After the initial battle with it’s sucesse and failures, the British continued to develop the tank and improved the Mark I one to produce the Mark IV and then the Mark V. By the end of the war the British army had produced 1220 Mark IV’s and 400 mark Vs. Simultaneously with the British effort the French were also conducting experinments with the Holt tractor and armored boxes. The French introduced two early heavy tanks in early 1917, the St Chamond and Schneider CA1. Both of these designs were based more or less on the basic Holt tracks, but the French put the vehicles into production without the redesign that the British did. These efforts were driven by the French arms and auto industries rather than coming from the military itself. The first French tanks went into battle in the spring of 1917 and by and large demonstrated the problems with the Holt track system. The man who was responsible for France’s tank effort was Jean Baptiste Eugène Estienne, an artillery officer who also was technically minded. he had pioneered the early French military aviation effort and developed techniques for indirect artillery fire. Artillery though, was not able to protect the the poor infrantry soldier from machine gun fire. Estienne said this;”Messieurs, la victoire appartiendra dans cette guerre à celui des deux belligérants qui parviendra le premier à placer un canon de 75 sur une voiture capable de se mouvoir en tout terrain (“Gentlemen, the victory in this war will belong to which of the two belligerents which will be the first to place a gun of 75 [mm] on a vehicle able to be driven on all terrain”).” He was right. Unfortunately that machine would not exist until the was over. When the failings of the St chamond and Schneider became evident, Estienne was approached by the head of the Renault who said that he had been developing a light tank design that could be produced quickly and in numbers. Throughout 1916 Estienne fought the French military establishment to keep the power that be from stealing resources for their scared cows and bloated projects. Estienne was able to keep thing going and the result was the Renault FT-17. The FT was the most import tank of WW1 and probably the most important tank ever. It eschewed the land battleship thinking that had prevailed in many of the tank designers of the time and afterword for being a design that was uniquely it’s own. It was small than huge and simple. But it could do the job well, putting fire on top of the trenches and giving the infantry it was supporting critical support exactly where it was needed. It was mobile enough to keep the battle moving and well protected enough to stop most of the fire that could be easily directed at it. And it could be produced quickly in numbers. This made the little FT the right tool for the job. A short French documentary on the Renault FT 17. 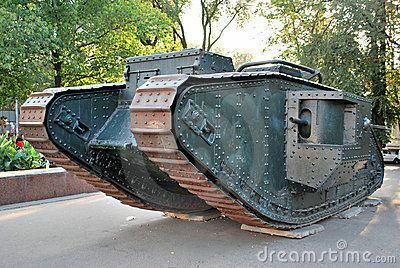 For all it’s effect on the public, the tank never made much impact on the course of the war. The tank was too new and relied on an auto and truck industry that itself was still in it’s infancy. The kinds of power plants and mechanical components that the tank required simply did not exist in 1917. It would take 25 years of metalurgical and engine development to make the tank the terrifying thing it was in the Second world war. Still the tank captured the imagination of progressive military officers like J. F. C Fuller.https://en.wikipedia.org/wiki/J._F._C._Fuller, Heinz Giuderian, https://en.wikipedia.org/wiki/Heinz_Guderian, George Patton, https://en.wikipedia.org/wiki/George_S._Patton and Estienne himself, all of whom wrote about how to restore mobility on the battlefield using Armored vehicles. That would be the next war.